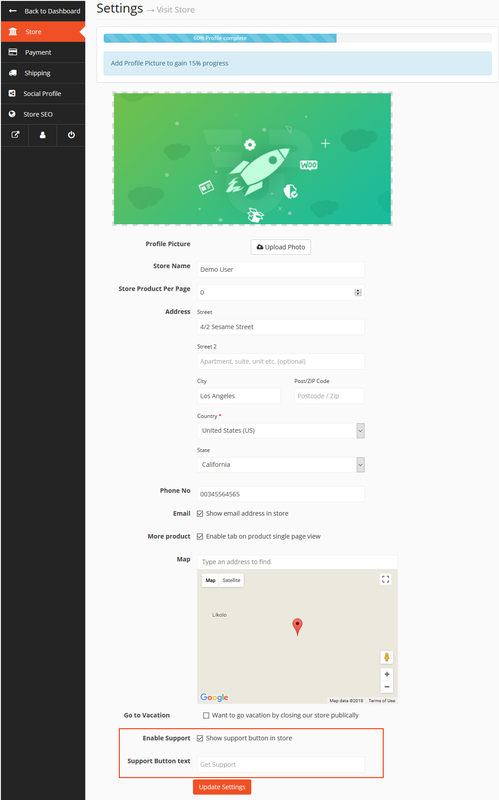 Dokan plugin has a built-in widget for contacting vendors from their product page. But it sends an email directly to the seller, exposing the mail address of the customer. The marketplace owners did not like it. So, we introduced this new support system for the vendors. The Dokan Store Support module is for existing clients who have purchased one or more items from a vendor. This module puts a Get Support button on vendor's store for customers to generate support tickets for the product/service they purchased. When a customer creates a support ticket from the vendor's store page, the vendor gets notified via mail that there is a customer waiting for support. Similarly, the customer gets notified via a mail when the seller has replied to his support topic. Navigate to your WP dashboard→Dokan→Modules. Find Store Support and turn on the toggle button on the top right to activate this module. The marketplace admin only has to install and activate the plugin. The configuration is for vendors themselves. The vendors need to enable this feature from their vendor store settings page. To allow a vendor's customers to send product-related queries and issues, the vendor needs to enable the support button display on his store page. To do this, navigate to Vendor Dashboard → Settings → Store. Enable Support: You need to check the box for using store support feature. Support Button Text: You can modify the store support button text from here. After configuring, click on the Update Settings button. 2. 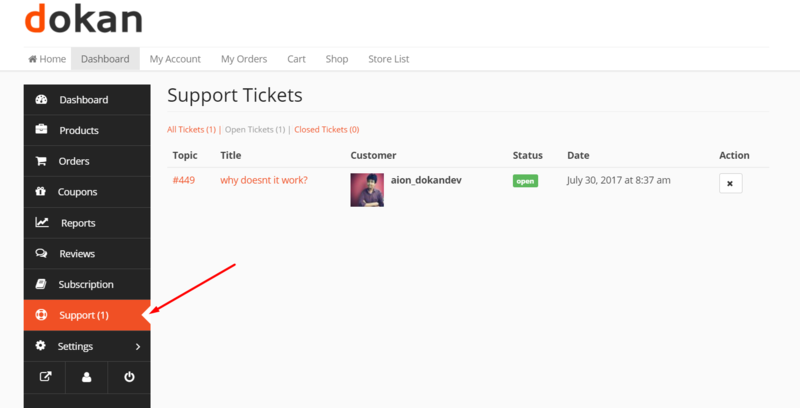 When the admin enables Store Support module, a Support menu will also appear in the vendor's dashboard. To view this, go to Vendor Dashboard→Support. View all their tickets under All Tickets. Filter them by Open Tickets and Closed Tickets. View Status and Title of each ticket, Customer's name, Date when the ticket was created and also the Topic/order number. Close or Re-open a ticket directly from the Actions column with or without responding to the ticket. This action can be done from all 3 tabs – All Tickets, Open Tickets, and Close Tickets. 4. 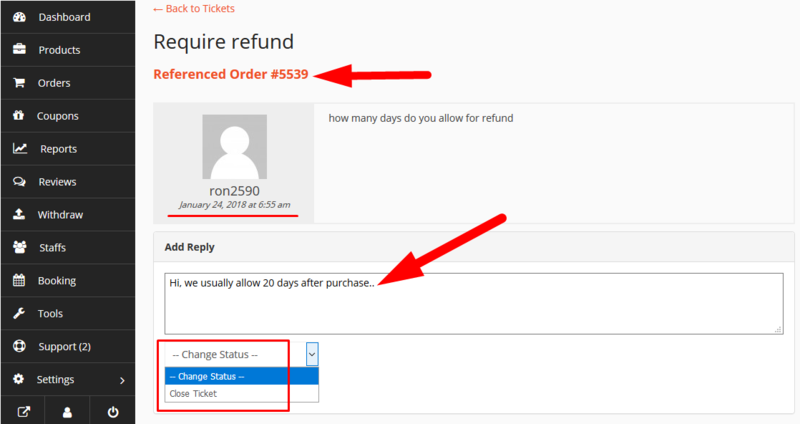 To respond to a customer's ticket, just click on the Topic or Title. This will open up a new page. From here you [the vendor] can write your reply to your client in the given box. You can also change the status of the ticket using the drop-down. 5. Vendors can add as many replies as they want. And customers can also reply to vendor's responses. 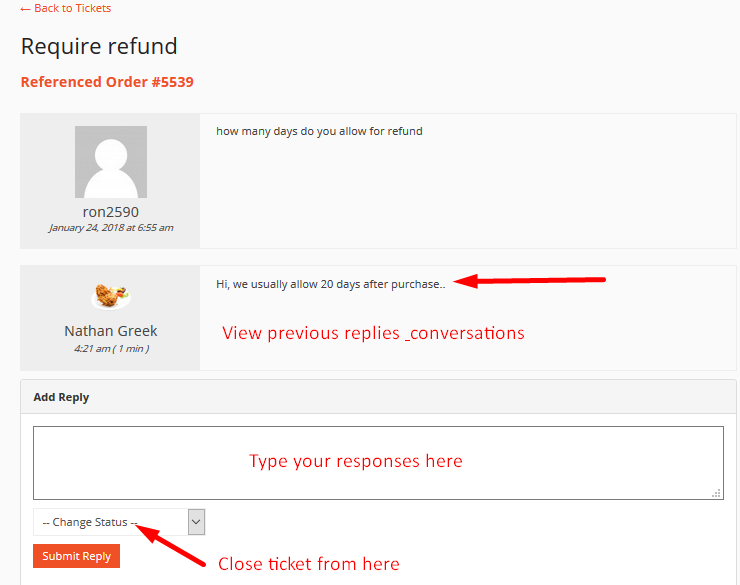 After adding a reply, vendors can view the entire conversation, add more replies, or choose to close the ticket if they want. To open a new support topic, customers have to navigate to their vendor store page. First, customers need to log in to their account. Now, visit your vendor's store page from whom you have purchased. You will notice a Get Support button on the right side, below the name, description and banner image of the vendor. After clicking Get Support, a pop up form will appear where you will be able to insert your issue or query. This pop up form will ask you to enter a subject, select order number using the drop-down, and type your message. After installing this module, the customers and the sellers, both will be able to see a new menu option on their my-account page. This button is to view the existing support tickets. When the marketplace admin activates Dokan Store Support module to power up Dokan, it enables a widget on each vendor's store page. This widget includes a support form which has important fields like name, email and message. This can be used to contact a vendor on the go from their store. 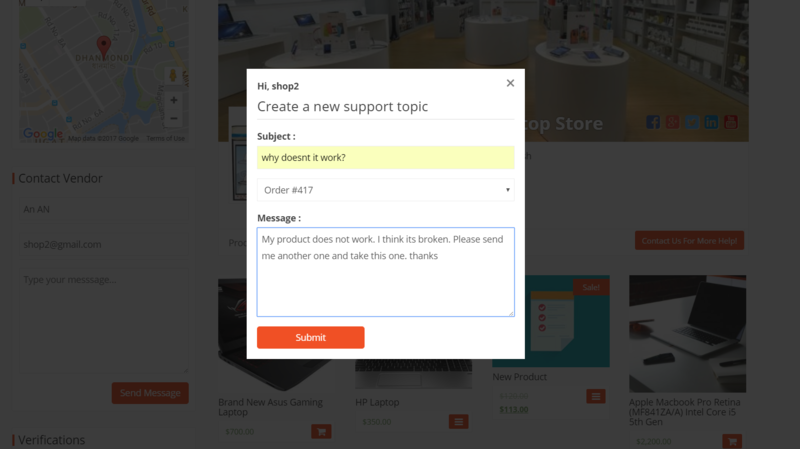 If a customer creates a new support topic, then the seller will receive a notification email stating that he has to reply to a support topic containing the link to reply. Similarly, when a seller replies to a topic, the customer will also get a notification email stating that he has got a reply and will contain a link to view that topic. If you have any feature request or having difficulty to understand this doc, please let us know in our support forum.